Disclaimer: This blog post focuses on the 4-H livestock, etc. Watch for other MNbump youth highlights from throughout our County. There is more to 4-H than is covered in this post… and more youth opportunities than 4-H! 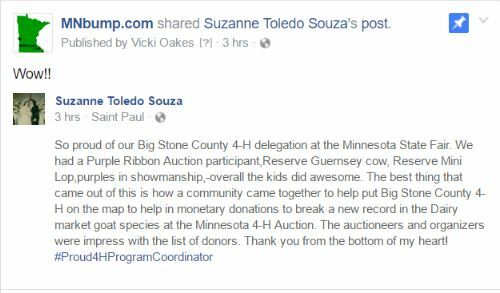 Our 4-H Youth, their families, those that extend their farm sites for animal housing and 4-H director, Suzanne Souza are amazing! You do not have to spend much time around the barns, the 4-H Exhibit building and the 4-H food stand (and malt stand!) before you see into an amazing world of learning (through some hard work and dedication) and a network of support that is really hard to put into words. They are competing to do and be the best – yet it does not appear to take away even in the slightest of ways their total support for each other! One short and personal observation… I started video taping the judging in the morning and spent the day taking pictures, video, and posting on social media until I was about 15 minutes late for the start of the rodeo (which was awesome!) – after the rodeo we headed to the 4-H Food stand. I was so tired I contemplated just heading home and crashing – but we stopped to eat. As I sat there exhausted eating a late dinner, the young gal that had waited on us stopped to see how everything was and if we needed anything else. I realized that I had seen her showing animals in the morning – I looked around and realized that I recognized every one of the youth working in the booth since they had also been showing animals that morning – starting even earlier than I had arrived in order to prepare their animals for show! AND, not one of them was dragging! They were happy and very busy since the food stand was packed after the rodeo! We have much to celebrate in our 4-H youth here on the MNbump!! Big Stone County 4-Hers ROCK!